Two words came to mind when I started the concept of this card: space samurai. Isn’t that cool? 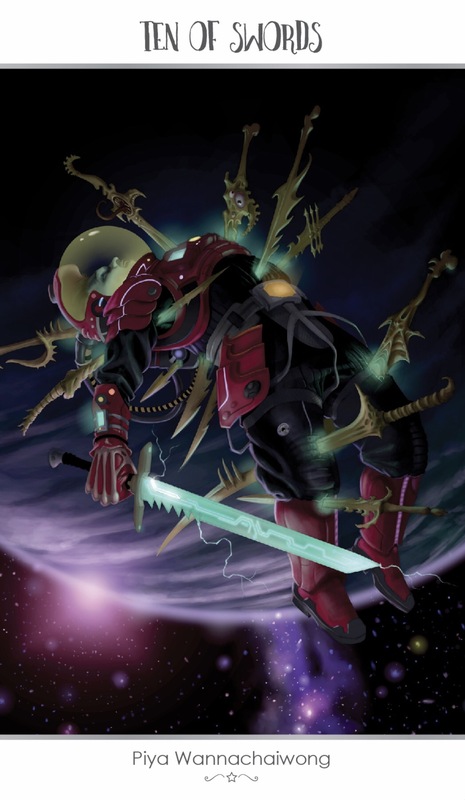 I just loved the idea of a warrior in a space suit armed with a sword…what could be more ridiculously fantasy/sci fi? I didn’t want to get overly bloody with this painting because I find gratuitous violence to be distracting and rather juvenile, so there is little blood in this painting. I compromised a little by making the space suit red to hint at the violence. If you’re wondering about the swords impaling the guy representing bones, I wanted them to look utterly alien, almost like the swords of the enemy are alive. Also, I wanted my character to be heroic, even in death so first, I had him holding onto his own sword, even after death. Second, all the blades piercing him stabbed him from the front. He fell facing his enemies head on; he was not stabbed in the back while fleeing. When this card appears in a reading, you don’t need to be told that it’s been a tough time recently. You’re painfully aware of it already – and just when you thought things couldn’t get worse, they do. You’ve been feeling as though there’s no end in sight, and if you let yourself start crying about it, you’re not sure whether you’ll stop. But there is hope. This will pass – the sun will rise tomorrow, making everything brighter. This entry was posted in Artist, Deck Review, Featured Card of the Day, General Tarot, Readings and tagged 10 of Swords, 78 Tarot, Astral, Tarot.